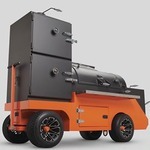 Yoder Smokers Community Forum • View topic - Smoking Tri-tip? Anyone doing it? I love this cut of meat - cooked medium rare and sliced thin. So much flavor. Extra credit: what about buffalo tri-tip?? Ah, right. Just treat them like a big steak. Makes sense.